Until yesterday, Google had been offering anyone who purchased a Pixel 2 XL $100 in Google Store credit. 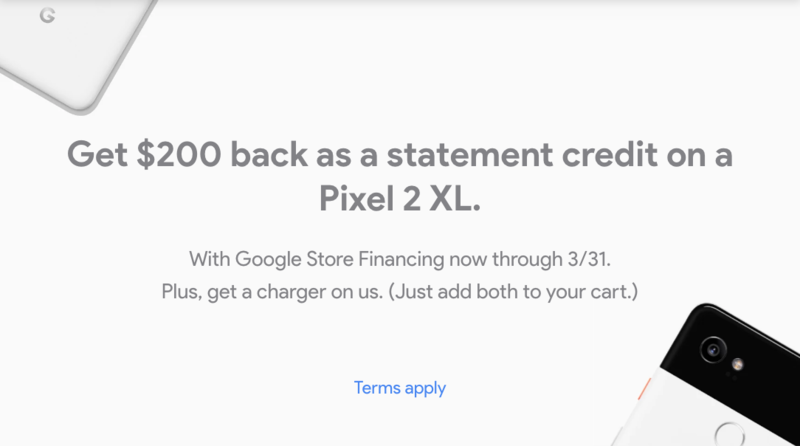 But now, a new offer for the Pixel 2 XL has taken its place: a $200 statement credit when financed with Google Store Financing. A free 18W charger will be thrown in even if you don't choose to finance. The Google Store has only run one financing deal before, and that was a $75 credit on the Pixel when it was just already eight months old. This $200 credit is much more enticing. Provided that you're approved, you'll see your $200 credit posted to your account after up to two billing periods. Even if you don't finance, though, Google will throw in an 18W USB Type-C power adapter and a 1M USB Type-C cable free of charge. This is the same one that comes in the box, but it's always nice to have a spare. The discount will show up when you add it and the Pixel 2 XL to your cart. Of course, this alone isn't as great of a deal as the previous $100 store credit, but it's something. This deal started a few hours ago and will last until March 31st at 11:59pm PT. Only one statement credit is allowed per account, and keep in mind that only the Pixel 2 XL is eligible.